Warren Ellis is one of the many high-profile creators that has made Image Comics the home for his recent creator-owned projects, so it was a surprise to hear that he would be launching a new miniseries from young publisher AfterShock Comics. AfterShock has built up quite the stable of talent over the last year, and Ellis joins other industry veterans like Brian Azzarello, Amanda Conner, Garth Ennis, and Mark Waid with Shipwreck, a six-issue psychological horror thriller steeped in hard science fiction. 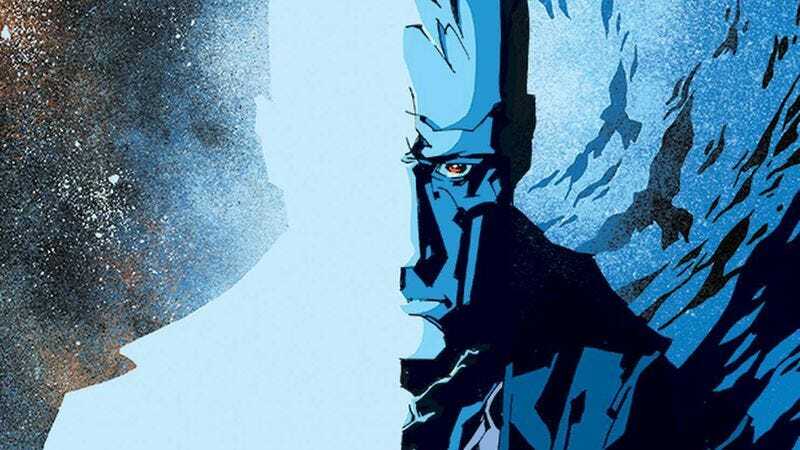 He has another veteran by his side in artist Phil Hester, and Ellis gives his collaborator a challenging script that pushes him to deliver some of the most evocative and haunting imagery of his career. Shipwreck #1 (AfterShock Comics) is a comic that prioritizes feeling over plot, and the creative team wants the reader to fully comprehend Dr. Jonathan Shipwright’s isolation, disorientation, and fear in his bleak, mysterious new surroundings. There’s an overarching narrative involving Shipwright’s search for the saboteur of the experimental test flight that left him lost and stranded, but it plays second fiddle to the atmosphere. While the exposition-heavy conversation between Shipwright and an unnamed inspector gives readers necessary background information in the dialogue, the visuals are reinforcing the underlying tension of the scene and Shipwright’s growing discomfort. The sunny landscapes on the pastel wallpaper create the illusion of calm within the diner, but as the conversation continues, a cluster of spiders encroaches on Shipwright. Those spiders will take over the entire page design by the time Shipwright moves on, and the final page of their conversation is an exceptional example of Hester’s skill for reinforcing emotion through composition. Shipwreck plays like The Prisoner by way of David Lynch, with Shipwright waking up confused in a desolate expressionist landscape and encountering unsettling characters that occupy their own vividly colored spaces. Color plays a huge role in the storytelling, and Mike Spicer makes dramatic palette changes to reflect the script’s tonal shifts. He drains color from the page to emphasize somber emptiness at the start, and uses high-contrast, minimally rendered colors to accentuate the mania of the murderer Shipwright meets when the story takes a terrifying turn in the last scene. The vivid colors blend beautifully with Eric Gapstur’s heavy inks, and the omnipresent shadows in the artwork ensure that there’s never a break in the ominous mood. Along with Jesus and Sherlock Holmes, Arthur Pendragon might be one of the most instantly recognizable and remixable characters in Western literature, and comics are no exception. It’s a compelling story after all, with a built-in hero’s journey and a plethora of villains and sidekicks to choose from, not to mention a love story that can be built up or discarded as the author chooses. Frank Cho’s thrown his hat into the Arthurian ring with Skybourne #1 (Boom! Studios), a modern twist on one of the most famous tales that almost everyone knows. Cho, who’s been criticized for his sexualized cover images of women, is at his best artistically when he’s not concentrating exclusively on covers. Skybourne #1 looks and reads like an old-school James Bond movie, more so even than Warren Ellis’ current run on the James Bond comic. Where Ellis’ Bond is very clearly a modern one, focused on technology and corporate intrigue as well as international incidents, Skybourne is more summer blockbuster than shadow government. Cho is both writing and drawing the comic, a rarity for him since he began to take work from larger publishers, and Skybourne is his first foray back into original content in a while. Unfortunately, it shows. Skybourne #1 is without a doubt beautifully drawn. When Cho is concentrating on action and motion instead of cover art, his skill comes to the forefront instead of getting lost behind his questionable choices for poses and details. He’s got an excellent eye for realistic human anatomy, and the way he draws people in motion is compelling and dynamic. His technical skill cannot be questioned, and in the case of Skybourne it’s enhanced by excellent colors from Marcio Menyz, who has mostly worked on Dynamite titles in the past. While the art is gorgeous, the writing is flat and uninspired. The basic storyline in this first issue is interesting, with modern weapons dealers vying for control of Excalibur and some great fight scenes. There’s even a couple of nice comedic beats, and one of the main characters, the only woman, has a wonderful moment where she gets to slaughter some men who underestimate her. But the choice for the story’s villain is odd, and there’s not enough information about them or the Skybourne family to compel readers to return for more in the second issue. It’s basically an uninterrupted series of fight scenes with dialogue so stilted and blatantly repetitive that it feels robotic. Cho’s choice to kill off the only woman in the book, who looks suspiciously like Wonder Woman and spends the entire issue getting insulted by men on the basis of her gender, feels both lazy and insulting. Art books are as much about the artist as they are about the art. That is to say, rather than simply collecting and cataloging images, they construct a narrative about their subject—particularly when they purport to cover the artist’s entire oeuvre. They select and curate a career; they provide a snapshot that can help shape how an artist is perceived. Such is the case with The Art Of Jock (Insight Editions), which covers the titular cartoonist’s beginnings on 2000 AD through his recent work on comics like Wytches and films like Ex Machina. And here, his career is framed as one built on dynamic but discrete images rather than a sequence of images. The book is divided into four sections: “Beginnings,” “Comics,” “Posters,” and “Film,” and it inadvertently gives the impression of an artist infatuated by comics but, ultimately, rarely involved with sequential art. Divided into three sections detailing his lurid, ink-smattered artwork (“Beginnings” being composed of text and photos of the artist at work), “Comics” is longer than the film-focused sections, “Posters” and “Films,” but only slightly, and there is a noticeable level of difference in attention paid to the subjects of film and comics. In “Comics,” Will Dennis, The Art Of Jock’s writer, focuses almost exclusively on Jock’s breakout and high-profile work: The Losers, Scalped, Green Arrow: Year One, and Batman: The Black Mirror. That is not a wholly inaccurate representation of the cartoonist’s output, though it does largely omit smaller profile work. This career snapshot, however, argues in favor of the idea that Jock’s reputation is built largely on cover work. Each major project is given a brief explainer text, but the book mostly highlights the cover images, prominently presenting them: large and isolated. With a few exceptions, interior pages are arranged four to a page, and they are presented at a distinctly smaller size than the covers. Alternatively, the poster work and the production art are more prominently featured. Pieces are rendered at larger sizes, accompanied with more production work, and featuring more contextualizing text. The book lends these posters a greater import.